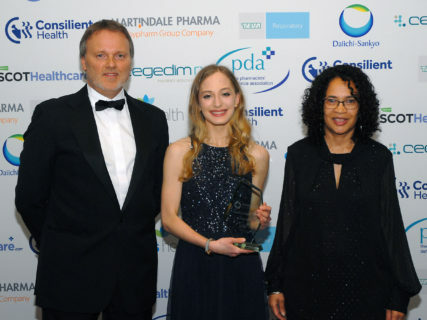 The Scottish Pharmacy Awards took place at the Hilton Glasgow Hotel last week. The annual celebration has a positive impact on the pharmacy sector by recognising exceptional pharmacists and showcasing their accomplishments. This years’ event was presented by Rachel McTavish. There were over 300 guests on the night with 11 accolades distributed throughout the evening – with the varied categories ranging from Respiratory Project of the Year, and Community Pharmacist of the Year Independent, to Advances in Travel Health and Vaccine Services in Community Pharmacy, and to Student Leadership, which was sponsored by the PDA. Each year the PDA sponsor the same category in the Northern Ireland, Welsh and Scottish Pharmacy Awards. Funds were raised on the evening for the 2018 nominated charity, Pharmacist Support, which works for pharmacists and their families, as well as former pharmacists and pharmacy students, to provide help and guidance in times of need. Pictures from the awards can be viewed here.